The greatest discoveries are made by those who can see what others haven’t – those willing to look far ahead, try a new way, embrace a bold idea. Founded in the first textile mill to have electricity – the result of R.Y. McAden’s visionary partnership with Thomas Edison – Pharr has long prized innovation. Pharr’s ability to anticipate the market’s future needs, embrace bold ideas and respond nimbly has contributed to its growth over the years and driven some of its most successful product offerings, including revolutionary high-performance yarn. Our family-owned company’s extraordinary dedication to serving clients has created the support for innovation to flourish across Pharr’s diverse businesses. And all this visionary thinking stems from a deep-rooted family culture that values relationships and empowers people. Bold, energetic and innovative, Pharr can move forward as a family of companies driven by innovation and committed to the values that make it possible. Innovation thrives at Pharr because we are a principled, passionate company guided by our values. Our values have shaped our progress thus far and serve as a compass to point Pharr forward. Family-founded and led, we build and nurture an empowering family-centered work culture as we develop products and services that ultimately benefit other families. We encourage and expect employees to bring bold, inventive thinking to our products and processes, ultimately propelling Pharr with the power of innovation. We are always there for our clients: quick to deliver what we promised, quick to support them and quick to anticipate their future needs. We protect, cultivate and prioritize strong relationships with our clients and our colleagues because we know relationships are the foundation of success. We earn the respect and trust of our clients, vendors and industries because we always deliver what we promise, and we always make good on our word. Pharr empowers passionate individuals to strengthen our community. Pharr’s family culture goes much deeper than the fact of its family ownership. Family is not just a name that inks company leadership, but a lens through which Pharr views the world makes decisions and ultimately, fuels growth. 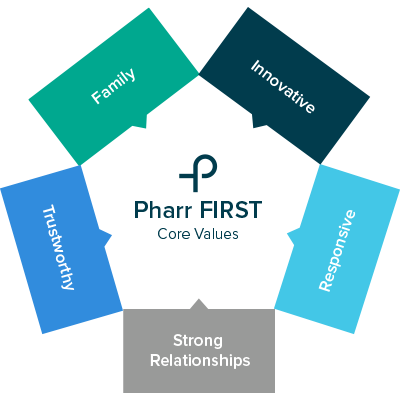 Each of the businesses in Pharr’s ecosystem shares a set of values that have distinguished Pharr since its founding: emphasis on relationships, commitment to employee and community wellbeing, dedication to serving clients and focus on innovation.